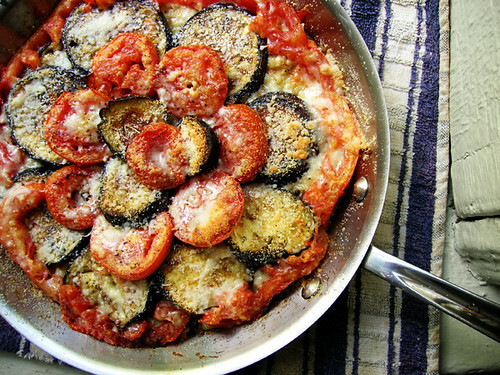 Ahhh the tomatoes and parmesan were begging for eggplant! If you can get zucchini-shaped eggplant instead of giant globe eggplant, it's easier to arrange the slices nicely. Be extra generous with the olive oil when you're roasting the eggplant. Meanwhile slice eggplant into 1/4-inch slices, drizzle baking sheet with more olive oil, arrange eggplant slices in a single layer, sprinkle with salt and pepper, and roast for 10 minutes. Flip eggplant slices, sprinkle with a bit more salt and pepper, and roast for another 10 minutes. Drizzle even more olive oil into the skillet, and don't worry if there are burnt on bits of quinoa and onion. Spread half of the quinoa in the bottom of the skillet and arrange half of roasted eggplant over that, spread the rest of the quinoa over that and arrange the rest of the eggplant on top, then arrange the tomato slices around the eggplant. Sprinkle with the rest of the parmesan over everything and bake for 20 minutes until golden brown.